I’m so excited to share this post with you! I’ve spent a good amount of time compiling some of the best lifting technique videos I’ve found and people ALWAYS ask me where to go to learn, so I’m hoping this is going to be very helpful for a lot of you. If lifting is very new to you, here are a few key points you need to remember about WHY lifting is SO important for that “toned” look you want. I’m not necessarily going to cite specific scientific references here, but please do your research on your own if you want to investigate further. Muscle Burns Fat/Calories AT REST. Yes, even when you’re binge-watching Netflix. Wouldn’t it be nice to feel like your body is burning fat ALL THE TIME? Well, when you are lifting and building muscle, that’s what’s going to happen. Sometimes I want to scream this from the rooftops because it was such an epiphany when I figured this out. And look, you calorie-counters- I know your treadmill “counts” them for you, but honestly those overestimate…a lot. (Sorry!) And the worst part is if you are doing steady state cardio (staying at one speed the whole time) your fat-burning stops after your workout. But a heavy lifting sesh? It just keeps on going. It’s like the energizer bunny. Except burning your fat and building your muscle. I love that. Muscle needs proper nourishment to grow. You can’t build muscle on 1,200 calories. You can’t build muscle on 1,200 calories. YOU CAN’T BUILD MUSCLE ON 1,200 CALORIES! I don’t care what “SHAPE” magazine says or what your favorite actress does. It’s bogus information. Now, I’m sure someone will comment with some obscure argument to this, but the bottom line is 99% of the time, it’s just not wise to go by the 1,200 calorie rule if you’re trying to get fit. It actually hurts you. For me, the best part about focusing on lifting/building muscle is that you GET TO EAT! Yes!I absolutely love food and can eat more than most people think I can. Do you think I eat side salads when I go out to dinner? No. This girl can down a half of a pizza at one time if I feel like it. Not that I do it all the time. But pretty much if it’s after an insanely heavy lifting session, it’s mainly going to get used as fuel for my muscles. In other words, I can get away with things I used to couldn’t get away with. No, this isn’t an excuse to gorge yourself all the time.But it’s a testament to the fact that muscle needs fuel to grow. You should focus on making it clean fuel- high protein meals with tons of veggies, fruits, whole grains, etc. But if you eat a cookie here and there, there is no need to get up in arms about it. Lifting can afford you some mental peace in that dept. Your body and muscles are working FOR YOU. Isn’t that awesome? Alright! Now that we’ve got that covered, on to the fun stuff! Below are some basic lifting techniques. These are the compound lifts, aka these lifts WORK EVERY SINGLE MUSCLE IN YOUR BODY. You don’t have to do isolation exercises to get fit and strong. I know lots of people do them. But if you want to maximize your time in the gym and boost your fat loss, this is the way to go! Some of them, especially the squat are rather long and descriptive but its SO important to get the technique right I highly recommend watching it in its entirety! Take notes, get someone to videotape yours and compare. It’s super important when you’re lifting heavy! A good starting rep schemes for these would be 3 sets of the heaviest weight you can do for 5 reps on each set. I suggest doing these 3X a week. Add deadlifts once a week, working up to your heaviest set of 5 on deadlift day! Friday: 3×5 squats, 3×5 bench press, 1×5 deadlift. Sometimes I add in some accessory lifts like assisted pullups, rows, etc. But if you’re just starting- don’t worry about that now. Continue to do some research and experiment if you like. But start with just the basic, compound lifts, first. Note: The above rep scheme is based on the Starting Strength protocol. 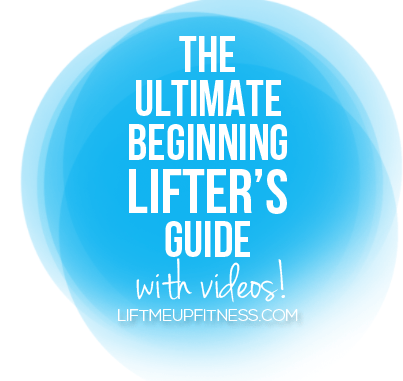 There are many different lifting protocols that are similar such as Stronglifts, and New Rules of Lifting for Women- feel free to investigate those, too! Basically do what YOU like. But what I posted I found is a great place to start! Honestly, you don’t need too much cardio when you’re following this sort of lifting scheme since it’s focused on strength building. But if you want to incorporate some cardio, stick to HIIT for around 15 minutes. Don’t overdo the cardio, because it can rob you of strength and muscle gains. Honestly, I made my progress by lifting alone and barely doing cardio actually, maybe 1X a week at the most? ESPECIALLY if you’re lifting, every meal needs to be centered around lean protein. A plate of vegetables just isn’t good enough, even though it’s technically “healthy.” Keeping your protein intake high is crucial for fat loss. If you’re a woman, 20g per meal is a good guideline. Chicken, ground lean turkey, Greek yogurt, eggs, protein powder (for protein shakes, protein pancakes, protein muffins, lentils, chicken, turkey, beans, salmon, tilapia, tuna, etc. I don’t personally eat red meat/pork but feel free to! I really can’t stress the protein consumption enough. Your body WILL NOT grow muscles unless you’re eating enough protein, and enough calories overall. “Do I need to count calories or macros?” Some people like to. But I personally HATE counting/tracking anything and I feel like in many people it can lead to disordered eating. I’m still making progress because I’m always pushing myself in the gym and keeping my protein/veggies/complex carb intake high and refined sugars low! “Do I need to go gluten-free?” Unless you’re a celiac, or gluten intolerant, then no. And remember just because a certain snack food is “gluten free” doesn’t automatically mean it’s healthy. Want to do some further research? Some of the best people out there include all the ladies at Girls Gone Strong, Jonathan Goodman, John Berardi, Mark Rippetoe, Charles Poliquin, and the guys at T-Nation.